The way that the Chargers have played to date in the 2008 season, they will gladly take a 20-19 win over the Kansas City Chiefs. Even if it was not the most impressive thing in the world. The team had to fight and scratch as if they were fighting for their lives on Sunday just to hang on for the win, but in the end, they did, and becuase of it they stay in the race to at some point finally make their move in the AFC West. The Chiefs were able to get within one at 20-19 with a Tony Gonzalez sensational TD late, but then instead of taking the sure tie, they went for two, and strong safety Clinton Hart made a play that the team may look back on that saved their season. It wasn’t the greatest play in the world on the two-point try, but Hart was able to deflect Chiefs QB Tyler Thigpen’s pass right to Quentin Jammer, who made the interception while on the ground. Hart, who had a big pass interference call earlier in the drive that allowed the Chiefs to get in position to tie the game, was the player that saved the day, and in the end saved himself from being the player that cost his team another huge loss due to the penalty that gave KC a shot at the TD and then win. The Chargers live to fight another day thanks to Hart and the play at the end. While it was a win, they had better get ready for a dogfight next Sunday in Pittsburgh vs a very testy Steelers team coming off a home loss to the Colts yesterday. A game like yesterday and the Chargers might as well not even get off the plane. Subscribe to Chargers Gab via RSS Feed or E-mail and receive daily news updates from us! 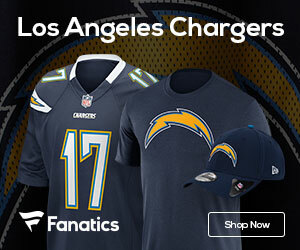 Sign up to receive our daily Chargers Gab newsletter, and keep up to date with all the latest Los Angeles Chargers news. Celebrity Seats has all the best San Diego Chargers Tickets and San Diego Padres Tickets!